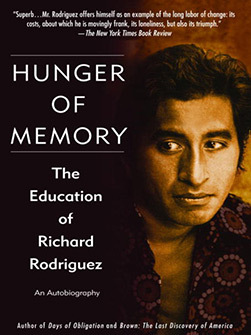 When Richard Rodriguez published his collection of six autobiographical essays, Hunger of Memory: The Education of Richard Rodriguez in 1981, roars erupted from both ends of the political spectrum. His conservative readers and critics were happy to hold him up as a minority student who had benefited from affirmative action but who in the end had rejected such programs as unfair to the real underprivileged—those who were impoverished or had never had the educational opportunities Rodriguez had enjoyed. Others saw in Rodriguez someone alienated from his Mexican-American culture and heritage, having betrayed his fellow Hispanics (a broad term meaning Spanish speakers but used in the United States to denote Americans whose forebears are from a Spanish-speaking country) by his denunciation of bilingual education and affirmative action. Rodriguez covers his first few confusing months in school, when he didn’t speak in class because he didn’t feel comfortable with what little English he knew. After a few of the nuns from his school ask his parents to speak English around the house, Rodriguez takes his first steps toward becoming a “public man.” Such assimilation into American culture is necessary and valuable, he asserts. As the book progresses, Rodriguez relates the story of his growing up, the power and pain of family ties, the role of the Catholic Church in his life, and his staunch rejection of affirmative action for ethnic and racial minorities in education and in the workplace. Richard Rodriguez was born on July 31, 1944, in San Francisco, California, to Mexican immigrants Leopoldo and Victoria Moran Rodriguez, the third of their four children. When Rodriguez was still a young child, the family moved to Sacramento, California, to a small house in a comfortable white neighborhood. “Optimism and ambition led them to a house (our home) many blocks from the Mexican side of town ... It never occurred to my parents that they couldn’t live wherever they chose,” writes Rodriguez in Hunger of Memory: The Education of Richard Rodriguez, his well-received 1981 autobiography. This first book placed him in the national spotlight but brought scorn from many supporters of affirmative action and bilingual education. Rodriguez, who could barely speak English when he started elementary school, finished his academic efforts as a Fulbright scholar in Renaissance literature with degrees from Stanford University and Columbia University. After leaving academia, Rodriguez spent the next six years writing the essays that comprise Hunger of Memory: The Education of Richard Rodriguez, aided for part of that time by a National Endowment for the Humanities Fellowship. Rodriguez has continued his writing career, occasionally serving as an essayist for the PBS series MacNeil-Lehrer NewsHour and also working as an editor with the Pacific News Service in California.